ABB’s most agile and compact collaborative robot is designed to fit easily into existing lines to increase productivity while working safely alongside people. The single-arm YuMi provides manufacturers of all sizes added flexibility and scalability to meet the challenges of high-mix, low-volume production in shorter cycles. It can be mounted on floors, tables, walls or ceilings, and is incredibly easy to program. The new collaborative robot is also one of the first of a new generation of robots from ABB to be built on a flexible new modular design platform that will allow a greater variety of robots and sizes, and more tailored solutions. 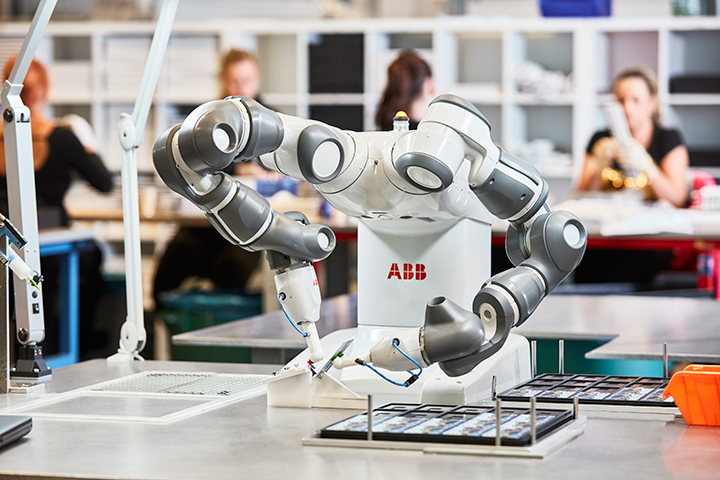 ABB’s dual-arm collaborative robot is designed to work very closely with humans in a wide variety of small parts assembly and handling applications. In the demo one YuMi arm is inserting a relay into the contactor block, and once a human has inserted the wires into the block, the other YuMi arm screw drives the terminals to securely fasten the wires into the block and relays. In this way the human and YuMi are truly collaborating on the various steps of the assembly process. A second human is prepping the parts to keep the operation moving. SafeMove2: ABB’s safety certified robot monitoring software that allows for the creation of more efficient and flexible production scenarios, and provides tools that speed the commissioning workflow for faster setup and validation. For example, if an operator needs to interact with the robot system, safety sensors can be incorporated into the robot cell to detect the person’s presence. After detection, SafeMove2 will either supervise the robot’s speed or monitor it while it is standing still. Once the person clears the zone, the robot can resume operation. ABB continues to build on its leadership in digital with a new virtual meeting tool for its RobotStudio® virtual commissioning and simulation software that allows teams around the world to collaborate and efficiently design automation systems with a 3D perspective. ABB will also preview a new Condition Monitoring and Diagnostics (CMD) application for its ABB Ability™ Connected Services. The CMD uses a machine learning-based advanced algorithm to detect behavioral anomalies in large robot populations and provide predictive maintenance and optimization guidance. With more efficient and advanced product technology entering the market, the demand for more intelligent and flexible robotic automation is ever increasing. Coupled with the ever progressing shift from mass production to mass customization, the need to efficiently serve individual customer preferences is a primary concern of manufacturers in many industries. 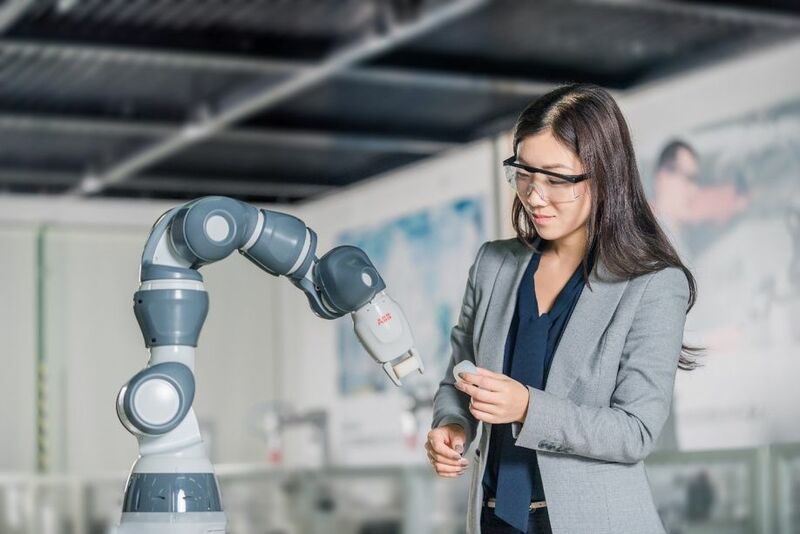 At ATX – West 2019 ABB will showcase a range of robotic technologies that provide the flexibility to efficiently meet the challenges of what has become the ‘new normal’ in manufacturing - high-mix, low-volume production in shorter cycles.